Triathlete Miles Stewart never entered a race thinking about finishing second. The harder and faster the race, the more he hunted victory. He might not have won them all, but it was rare to see Stewart finish back in the pack in a top event. Perhaps Stewart's biggest asset was his consistency. And his deadly finishing sprint. He always seemed to perform well in races that counted. His professional career started with a bang when he placed third in his first ever event at just 15-years-old. Stewart had found the sport that would make him a reckoning force. With an impressive background in swimming, speed skating, duathlon, aquathlon, triathlon and cycling - winning national championships in all six sports - he had no real weaknesses. Stewart made his first world championship pro team in 1989, aged 18, and finished a creditable fourth behind Mark Allen, the most successful competitor in triathlon history. 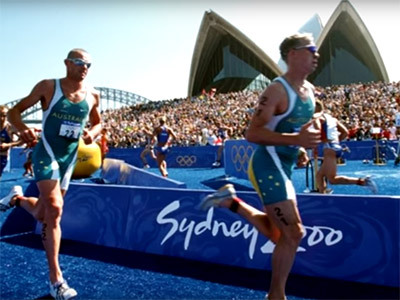 In 2000, the triathlon made its debut as an Olympic sport at the Sydney Olympic Games. Stewart's father and long time coach, Col, was appointed as Head Australian Olympic Triathlon Coach. Under his father's guidance, Stewart was the first Australian home in the event, finishing sixth overall. Just like it began, Stewart's professional career finished with a bang. In 2004, Stewart's last year on the international circuit, he was selected in the Australian team for the 16th consecutive year - arguably a record unlikely ever to be broken. In 2005, Stewart retired from the professional triathlon circuit ending a triumphant and wildly successful career spanning nearly two decades. Miles Stewart remains actively involved with triathlons and his foremost priority is to help raise the level of junior talent in Australia. He shares his knowledge and experience with young aspiring athletes through training programs, giving back to the sport that enthralled his life, and ours, for 19 years.